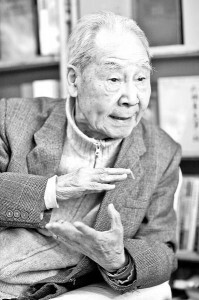 The 93-year-old Chinese translator Professor Xu Yuanchong has won the “Aurora Borealis” Prize for Outstanding Translation of Fiction Literature earlier this month. It’s one of the highest honors among international translators. It’s one of the highest honors among international translators. Since it’s set up in 1999 by the International Federation of Translators, this is the first time for a Chinese translator to win such an award. Why was the award given to Xu Yuanchong and what’s his story? “The reason we give the first prize to Professor Xu Yuanchong has involved his career in building bridges among the world’s Chinese, English and French speaking peoples. He has translated Chinese literature extensively into English and French, as well as having translated major works from western languages into Chinese, and has also published works on translation theory. Jurors took into consideration the vast number of readers around the world who might be reached by Professor Xu Yuanchong’s translations,” said Perpetua Uiterwaal, member of the International Federation of Translators and juror of the panel. Xu Yuanchong is best-known for his efforts in translating traditional Chinese poems into English and French. His work 300 of China’s Immortal Poems was published by British publishing company Penguin in 1994, and hit the shelves in Britain, U.S., Canada, Australia and other countries. It’s the first time the publishing company published a Chinese translation. Apart from translating the classical Chinese poetry into foreign languages, Xu also translated many of the British and French classics into Chinese. In his seventies, he was still involved in translating Proust’s masterpiece, Rememberance of Things Past. He advocates that the versions of poems should combine visual and aural beauties together, and they should reproduce the fusion of pictorial composition and musical arrangement. But Xu himself didn’t make it to the awarding ceremony for health problems. Jiang Yonggang, Vice Secretary General of Chinese Federation of Translators, read out a speech written by Professor Xu and received the award on his behalf. “I feel deeply honored to be the first Chinese translator to receive this award. I take this not only as recognition of my personal work in translation, but also more interest in Chinese literature. I have always taken great pleasure in translating Chinese, English and French literature. And I’m still translating at the age of 93. I simply love it,” Jiang said. Xu was born in 1921 in Nanchang, capital city of east China’s Jiangxi Province. His mother, who was well educated and good at painting, had a great impact on Xu in his pursue of beauty and aesthetic feelings. His uncle was a translator who translated Chinese plays into English and even had personal connections with the British dramatist George Bernard Shaw. These achievements made Xu develop a profound interest in learning English. He studied in the best local school, where his English had been outstanding. Then he took foreign language studies at Tsinghua University after he studied abroad. And finally he became a professor in English and French in Peking University. “Aurora Borealis” Prize for Outstanding Translation of Fiction Literature was set up in 1999, and is given every three years to one translator. Wang Gangyi, head of the Chinese delegation to the awarding ceremony, speaks highly of Xu’s achievements. “Professor Xu is an outstanding figure among Chinese translators. He has a though knowledge of both Chinese and western culture, and plays an important role in bringing Chinese culture to the world, and introducing western culture into China,” Wang said. Xu Yuanchong was awarded the “Lifetime achievements in translation” from the Translators Association of China in 2010.